Have you always wanted to drive a scooter, but you just couldn’t stand the thought of people laughing at your low-powered little vehicle chugging along at a pace barely faster than walking speed? 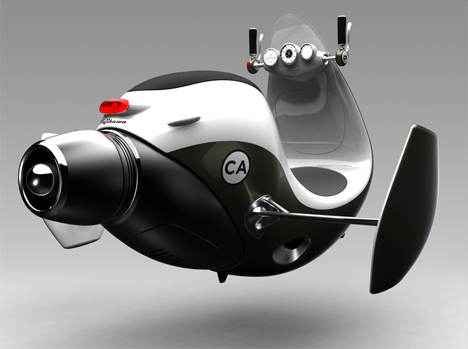 Artist Norio Fujikawa’s depiction of a hover scooter might be just what you need to quiet the doubter in you and get you onto a fuel-efficient scooter. 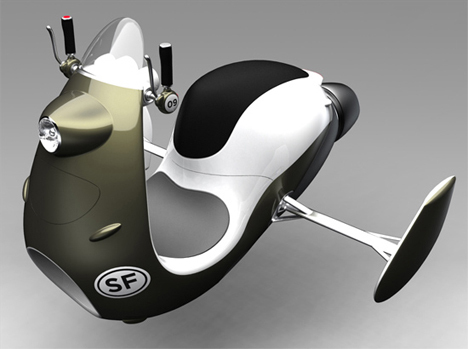 Of course, the hover scooter isn’t a reality just yet, but it’s fun to think about the possibilities. If a MAG-LEV infrastructure were present, it would be pretty easy for hover vehicles to become commonplace. But on an individual level, repulsion lifts might someday be used to give us the hover cars we so sorely desire. And this particular JetScooter is so pretty that we’d be first in line to take one home. See more in Concept Vehicles or under Transportation. February, 2010.